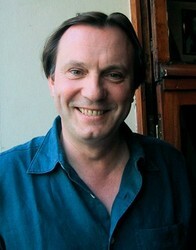 Philippe Roullier is a French actor and an artistic director (AD). At 15 years old he enrolled in the Dramatical Art Conservatory of Grenoble, France. He then started playing in different troupes of the region. In 1978, Philippe enrolled at INSAS (Bruxelles) where he studied for 2 years. In 1980, he went on to live in Paris where he worked in theatre for more than 10 years. He also landed television and movie roles. In the dubbing industry, he works mostly as an AD, but actively lends his voice to numerous movies, television series and animation.